Adding an aluminum awning to your home or business gives it just the right touch! Learn how to take care of your new metal awning! Many businesses have cloth awnings, but there are those select companies that opt for an aluminum awning. Don’t hire an outside company to clean your aluminum awning, you can save on costs and keep your money in your business. So how do you clean a metal awning? Use the correct tools to clean your aluminum awning. Everyday items can be used to clean your storefront’s awning. If you have a ladder, stand it up next to your metal awning and climb up with a brush and a bucket. Mix a gallon of water with two ounces of detergent and use the brush to scrub the awning with it. Make sure to rinse off the solution when the grime has come off. This ensures there is no residue left to stain the aluminum awning. If you have a pressure washer, that is an even better tool to use. Many homeowners have them to wash their decks as well. You may have a dual use. Don’t forget hidden spots on your awning. Many times, bees or spiders will create a home underneath your awning. It’s dry and shaded; the perfect spot for them to hang out. You do not want someone attempting to come into your business to get stung or run away because of arachnophobia. Make sure to clean the underside of your awning while you are up on your ladder. Be careful with pressure washing the underside, though. Believe it or not, metal awnings can gather a multitude of outside colors and become unpleasant to look at. Birds can leave droppings, leaves and branches from rainstorms can accumulate, and trash can be swept onto the top by a strong wind. Keeping it clean is necessary to attract customers and maintain curb appeal. Call Carroll Awning for your next aluminum awning installation. A great benefit of an aluminum awning is that you do not have to worry about adding a protectant. 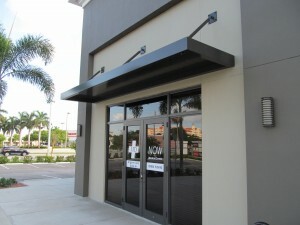 Aluminum awnings shield windows from the sun, and keep your business entrance cooler in the summer. They also protect from rain, snow and wind, to add extra life to the door – which means less painting maintenance for you! Carroll Awning provides the best quality energy efficient awnings and frames for any business or restaurant, as well as homes and apartments, for any time of the year. For a free estimate, call 1-800-999-5617 or click here to contact us online.